For Years Sri Krishna’s birth is being celebrated with great excitement all across the world on the day also known as Sri Krishna Janmashtami, which is the eighth day of Krishna Paksha of Bhadrapad month as per Hindu Calender. People celebrate this day by decorating various idols of Lord Krishna, Temple Premises and by fasting as a symbol of taking new resolutions on this sacred day and as a token of love, affection and devotion to Krishna. Krishna is said to take birth at midnight of Dwapar Yuga at Mathura somewhere in UP State when the whole Mathura and nearby villages of Gokul, Vrindavan were drenched by heavy rains. In the light of this fact people celebrate the festival by fasting all day till midnight. At exact midnight hour temple bells ring, conchshells sounded and kettledrums are beaten to announce the birth of Lord Krishna and aarties performed for his idols. People break their fast by distributing the prasadams in faithful in the form of Panchamrat. Lord Krishna’s birth is also said to be as full of dramatic events & happenings as his Complete Life in Indian Mythology. The story begins with Maharaja Ugrasen, who was a very kind hearted king of Mathura by the end of Dwapar Yuga. He was imprisoned by his own son Kansa for the greed of Kingdom. His throne was seized by Kansa and the people of Mathura were forced to live with his cruel and tyrannical rule. It was the time when people started praying desperately for the arrival of an avatar (incarnation of GOD in Human Form) to rescue them from the evils of Kansa. Kansa although was an Evil person, had a great love for his cousin sister Devki. It was during his sister’s wedding with Vasudev of Yadav clan when Kansa heard the Akashvani (Predictions from the Sky/Heavens) that his sister will very soon give birth to his slayer that will be her eighth son. The infuriated Kansa out of fear forgot all his love for his sister and ran to kill her, thinking after getting rid of her there would not be any question of son who would be his slayer. It is your difficult times that show you the mirror of your true self. Kansa could not maintain his love and emotions for his sister when he heard the heavenly prediction and his true color was exposed soon when he prepared himself to kill her. But as Divine Powers had taken a decision and Lord Krishna’s birth was inevitable, things moved in such a way that later, on Devki’s request Kansa agreed to not to kill her, but he imprisoned her and her husband Vasudev on the commitment given by Vasudev that each child will be handed over to Kansa soon after its birth. In this way to challenge the divine prophecy Kansa decided to kill Devki’s all children soon after their birth eliminating all possibilities ofKrishna’s birth. However during the birth of Krishna, a divine aura lit up the whole cell and Lord himself appeared in front of Devki and Vasudev, informed them that he is going take reincarnation as their eighth son and instructed them to leave him at village Gokul just after his birth and bring back the just born baby girl of Yashoda from Gokul. As every thing was planned at the highest Divine level, all of a sudden all guards fell in deep sleep at the prison cell and Vasudev was automatically free from all the shackles. 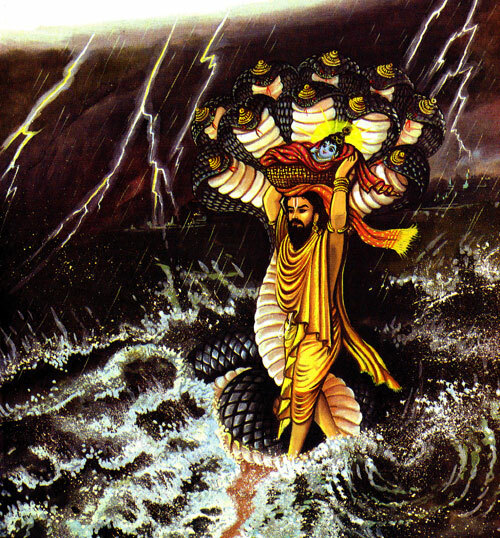 He took the son and reached Gokul after crossing heavily flooded Yamuna river. It was raining heavily that midnight as if nature was also trying to manifest itself aggressively as a welcome note to Lord Krishna. In the Yamuna river SheshNag himself materialized to shield the Divine Baby from the rain water through his thousand hoods. At Gokul, Vasudev placed Sri Krishna and brought back the baby girl of Nand and Yashoda to his cell atMathura. Following which all the shackles once again tied automatically and guards woke up by the voice of baby girl and intimated Kansa about the birth of eighth child. When Kansa arrived and tried to kill the baby girl, the girl appeared as Goddess YogMaya (Goddess of illusion) and declared that the eighth child has already taken birth and is now in safe hand. What was planned by the Supreme Divine had actually materialized in spite of all efforts of Kansa, and Lord Krishna not only killed Kansa and many other demons later over a period of time but also mark his presence in the History at various points – be it his holy pranks and miracles at Gokul, Vrindavan, or be it his primary role at Political front as a mentor of Arjuna, Mediator of Pandavas for Attempts of establishing peace or delivery of the Greatest Song of Sacred Knowledge to Arjuna during Mahabharata eventually providing the mankind the Greatest of the Epics – Bhagvad Gita. Thus the Sri Krishna Janmashtami ie the birth of Lord Krishna prepared the foundation of all the turnaround events of the History and is celebrated with a lot of excitement by the devotees all across the world. Best wishes to get writing this type of handy blog site. Your website is just not exclusively informative but also extremely artsy too. Now there are often extremely very few people that could produce much less painless article content of which creatively. Keep up the best producing ! !